It's almost the end of October and I can now announce that I am out of the swimming pool until next year. I was last in a week or so ago and although I managed to swim several lengths I wasn't happy unless I was moving, Leo loves his swimming and being the 'English' baby of the two he can take the cooler temperatures more happily but I think even he agreed it's just a little too chilly now. From April Leo and I swam, actually I think Leo even managed a little swim in March, and Louka started to join us in May. We call him our Cypriot baby (born here in August and covered in blankets by the midwives in 45 degree heat) as he is always cold and really only enjoys the pool in the hot summer months. This was Loukas year though, although not strong enough to be on his own out of reach of us or the edge of the pool he has ditched the armbands! 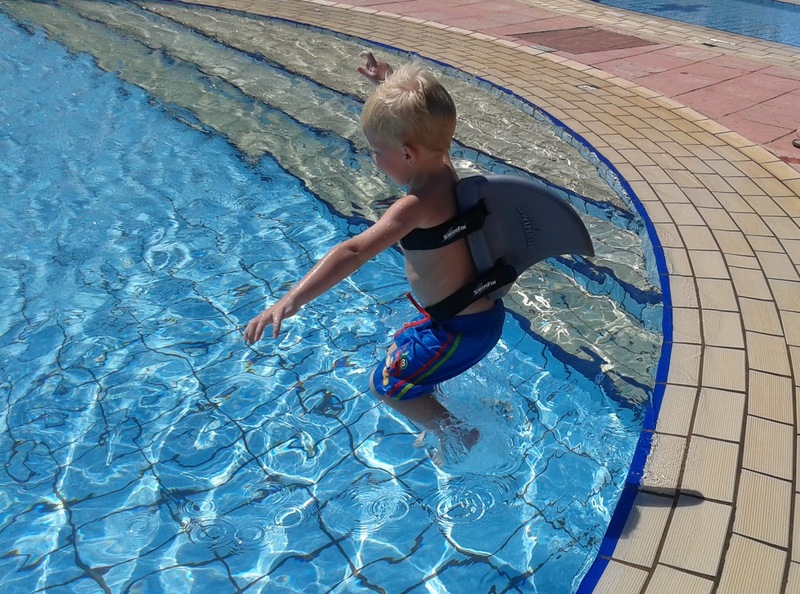 With a bit of help and confidence building from his SwimFin he went from not being able to swimat all without armbands to swimming like a shark in under 10 minutes! It was still the shallow end and he knew he could stand but he went right under the water, came up and started swimming. Surprisingly he didn't want to wear the SwimFin very often after that first day, but there was a real sudden improvement in his confidence. 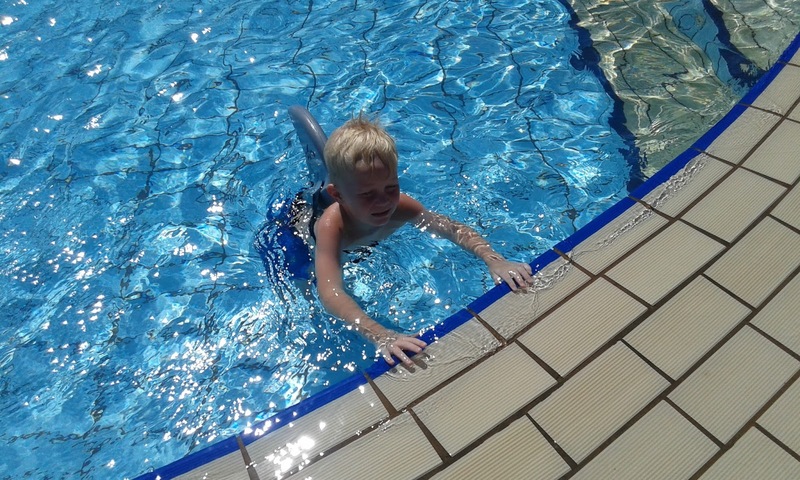 It was hard work in many ways as whereas before he would be happy enough in his armbands in the deep end or middle of the pool, suddenly he couldn't stay up all by himself with no effort at all, so we therefore had to be close to him all the time. 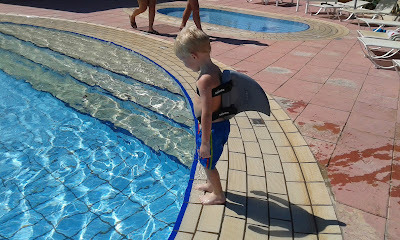 He did go back to the armbands a few times, usually when we were playing with the lilo and throwing the kids off backwards into the water, but every time he wanted to practise swimming it was either with the SwimFin or nothing at all. 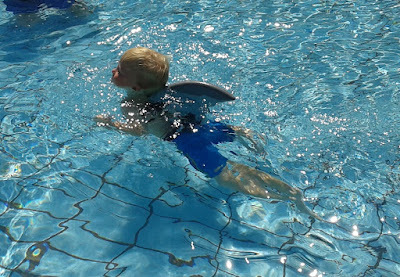 So after many weeks of being in the pool for at least a quick cool down each day Louka ended the summer being able to swim a width of the pool completely unaided. I'm sure now that by this time next year he will be as confident as his big brother. Pop over to their social media accounts for swimming tips, and more, you can find them facebook,twitter, Instagram, and even Youtube.